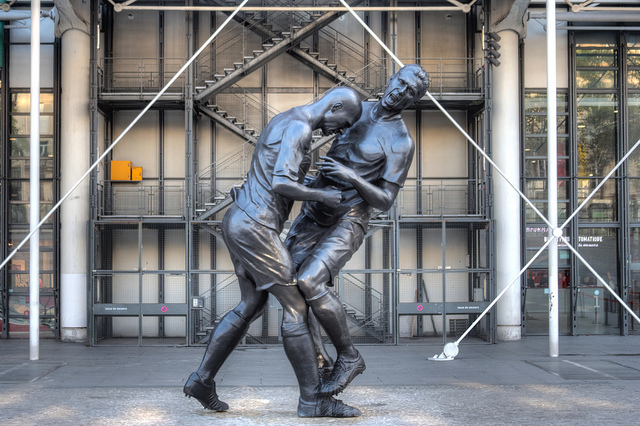 A five-metre high statue of Zinedine Zidane’s famous headbutt on Marco Materazzi has been unveiled in Paris. A similar incident may or may not have occurred at the Toronto City Sports Centre on Saturday night. ZFC Week 4 was just as incident filled as last week with plenty of goals scored and a few handbags at dawn. Gor Mahia lost 4-3 for the second consecutive week, AFC Leopards were too hot to handle with Mohammed Mandan continuing his record of scoring in every game this season and an absolute Xabi Alonso style scorcher from Tahir Jaffer making sure all the points went to the Leopards. FC Dynamo move into third with a convincing 3-1 win over relegation favourites Gymkhana thanks to a stunning brace from Hasanain Rashid and an outstanding man of the match performance between the sticks from Shahid Juma. Mozambique Stars stay joint top after coming from behind to defeat Taifa Stars 4-2. Zanzibar FC had increased the security detail for this event after the pitch invasion by the unidentified streaker last week, thankfully there were no such incidents this week. In the final match of the evening, top of the table Manama FC rallied from a goal down to edge passed Sofapaka FC 2-1. Manama FC were guilty of sqandering some guilt-edged chances in the second half that would have put the game beyond doubt. In an incident that can only be described as handbags*, Zain Abbas Merali and Azeem Amir were both booked in the second half. Merali’s yellow card is his second of the season, which comes with an automatic one-match suspension ruling him out of Sofapaka FC’s crunch tie with Gymkhana. After the final whistle there was a fracas involving players and spectators which is currently under investigation by the Zanzibar Central Intelligence Agency and therefore cannot be reported on. There are unconfirmed reports of raw mobile phone footage of the incident which has been leaked on the internet. WARNING: the video below may be unsuitable for children and mixed martial arts fans. * Handbags : a colloquialism, especially in the United Kingdom, used to describe an event where two or more players from opposing teams square up to each other in a threatening manner, or push and jostle each other in an attempt to assert themselves, without any actual violent conduct taking place. The phrase was coined when Margaret Thatcher was Prime Minister. She was said to give ministers who she saw as slackers a ‘good handbagging’, i.e. a verbal dressing down.